Are you ready for the 15th annual Wine & Spirits Magazine’s Top 100 Tasting Event? 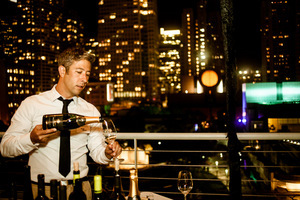 It’s always a fabulous tasting and event, and the weather usually cooperates so guests can enjoy the outdoor terrace at the Metreon. On Tuesday October 9th, you’ll get to taste and celebrate the Top 100 Wineries of the Year. You’ll not only get to enjoy some of the world’s most sought-after wines from around the world, but there are some delicious bites from notable restaurants as well (this year includes Montesacro, The Morris, Lord Stanley, and more), and an oyster bar, cheeses, and other tasty things. It’s quite the party. 6:30pm-8:30pm. Tickets are $125; VIP: $185 (early entry at 5:30pm). Ticket purchasers receive a one-year subscription to Wine & Spirits Magazine valued at $29.95. For the 15th year, the event benefits San Francisco Baykeeper, a nonprofit organization with a mission to protect, preserve, and restore the ecological integrity and productivity of the San Francisco Bay. Metreon, 135 4th St. at Mission.